By Golly, Molly! : I Heart Chocolate! I love chocolate. I've never met a chocolate I didn't like. Although quality dark chocolate is the best, Cocoa Puffs 100-Calorie Treats help me get my daily share without http://www.myfitnesspal.com/ going haywire on me. Come on now, no need to take it that far. It's sad, really. Who would say that anyway, other than maybe my dog? But hold on. 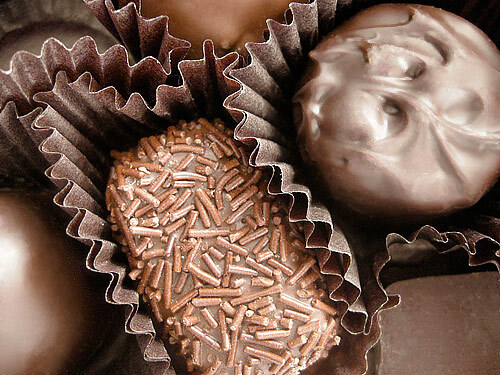 I do kinda sorta, occasionally, on a bad day omit the word “chocolate” and fill-in-the-blank with maybe: “Who needs love? Give me approval .. an amazing work-out .. a nice compliment .. a $5 bill found in my dirty jean's pocket .. or .. a massage with constant movement and without talking to me, please.'" Okay, I do realize I may be over-thinking this whole concept of replacing love with other joy-fillers such as chocolate. But I know me and my tendency to be all, "God is so good and so great and ALL I need - blah blah blah," all the while not being joyful unless I either get my way in a situation, find a cute shirt at Target, or have a Fiber One Brownie in my purse. What is my point? Because certainly nothing is wrong with enjoying life's simple pleasures. Maybe it's more of a matter of linking that good thing, whatever it is, to God taking pleasure in us? I know when my twelve-year-old son sits down to eat a slice of my famous chocolate cake - oh. my. gosh. - I cannot take my eyes off him and his unfiltered joy. He moans. He grunts. He makes weird little noises. It's like a two-fer. I get joy. He gets joy. Win win! So don't you think God has a father's heart like that for us? Of course! James 1:17 says, "Every good gift and every perfect gift is from above, coming down from the Father of lights with whom there is no variation or shadow due to change." And I'm pretty sure the Greek translation of the word "gift" in that verse has its roots in... chocolate.